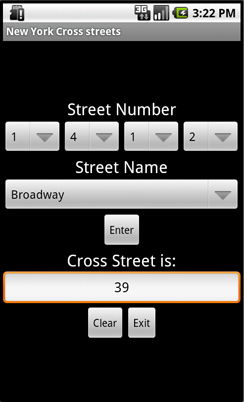 Find your New York City cross street fast! You've got an address on the long avenues of Manhattan in New York City, but no indication of where the address is actually located. 1600 Broadway? 192 Avenue A? There's no time to search miles and miles of street to find your address. and instantly find the cross street, no slow data-hogging maps involved!